Create a high-gloss, oxidation-free shine in less time! 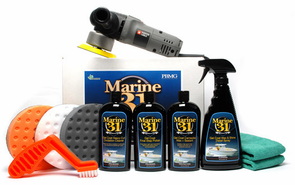 The Porter Cable 7424XP Marine 31 Boat Oxidation Removal Kit allows you to machine polish away years of neglect! Let the Porter Cable 7424XP Random Orbital DA Polisher do the work for you! When used on a Porter Cable 7424 XP, the low dusting, easy-to-use Marine 31 polishes quickly cut through dull and chalky finishes, unlocking the brilliant shine underneath. Matched with selected Lake Country CCS Foam Polishing Pads, these polishes are extremely efficient. To protect the shine you have created, the Porter Cable 7424XP Marine 31 Boat Oxidation Removal Kit includes Marine 31's Carnauba Wax + Sealant and Wax & Shine Detail Spray. These ecologically friendly products will help you keep your boat looking great no matter the seas that lay ahead. The Lake Country CCS 6.5 Inch White Polishing Foam Pad is a firm polishing pad designed to polish away the fine marks left behind from the previous step of polishing. 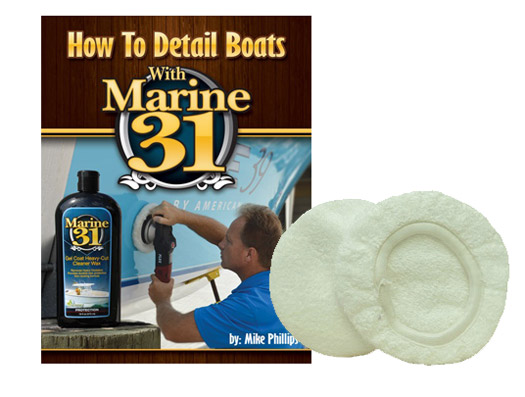 When used with Marine 31 Gel Coat Final Step Polish it will impart an even finish that is free of swirl mark and polishing haze. A total retail value of $314.88. You save $44.89! The demo video of the 7424xp was great and work just as stated. The Marine 31 products worked well, both the Saedoo's and boat look great. ConsWork the products on a 16" sq section with six full passes was a lot of work. But the final product is well worth it.